Christmas and New Year are popular times to receive a wedding proposal, so if you were one of the lucky couples to get engaged during the festive season you’ll no doubt be turning your minds to the planning stage. Even if it’s early days for you – you may not even have set a date or organised your venue yet – it’s never too soon to start browsing the extensive selection of wedding magazines and websites for inspiration for your special day. Lots of brides-to-be collate scrapbooks or mood boards with ideas for dresses, flowers and décor, or you could create an online pin board of ideas via Pinterest – this is a fantastic way to organise wedding images and to get inspiration from other pinners. There’s a truly exhaustive selection of dedicated wedding boards on Pinterest to dip into, packed with beautiful, creative ideas to help you plan your special day. Blogs are another great source of inspiration – we love browsing the real-life weddings on sites such as Snippet and Ink, 100 Layer Cake and Inspired by This. Covering everything from no-expense-spared wedding parties to more informal, DIY weddings, you should be able to pick up imaginative ideas that fit in with your budget on these beautiful sites. So, what’s going to be big in weddings this year? Expect to see more brides picking neutral, understated colour palettes for their décor. Colours like grey, taupe and champagne are expected to influence colour schemes, with accents of the traditional white still coming through. Our Contemporary Heart wedding range works particularly well with a neutral colour scheme – we love the idea of creating a sophisticated, timeless look for wedding tables, using crisp white table linen, studded with simple glass tea lights and silver heart confetti. Top elegant glassware with one of our delicate laser-cut ivory heart place cards and place a sophisticated clear heart favour box on each place setting. Add in some colour with your flowers – simple stems of Sahara roses (beautiful, blush-coloured flowers) compliment this scheme perfectly. The eclectic, vintage-style wedding will still be big. Modern brides will continue to look to the past for inspiration, using details like mismatched crockery, vintage table linen and heirloom pieces to create a personal, original setting for their nuptials. This look calls for some degree of leg-work as you may need to source vintage pieces from antiques fairs, second-hand stories or dedicated vintage wedding suppliers. But the end result will look lovely, particularly if you’re going for a rural setting, or a marquee in the garden. Compliment your vintage pieces with accessories from our Vintage Romance and Vintage Rose ranges – both work really well with an eclectic theme. 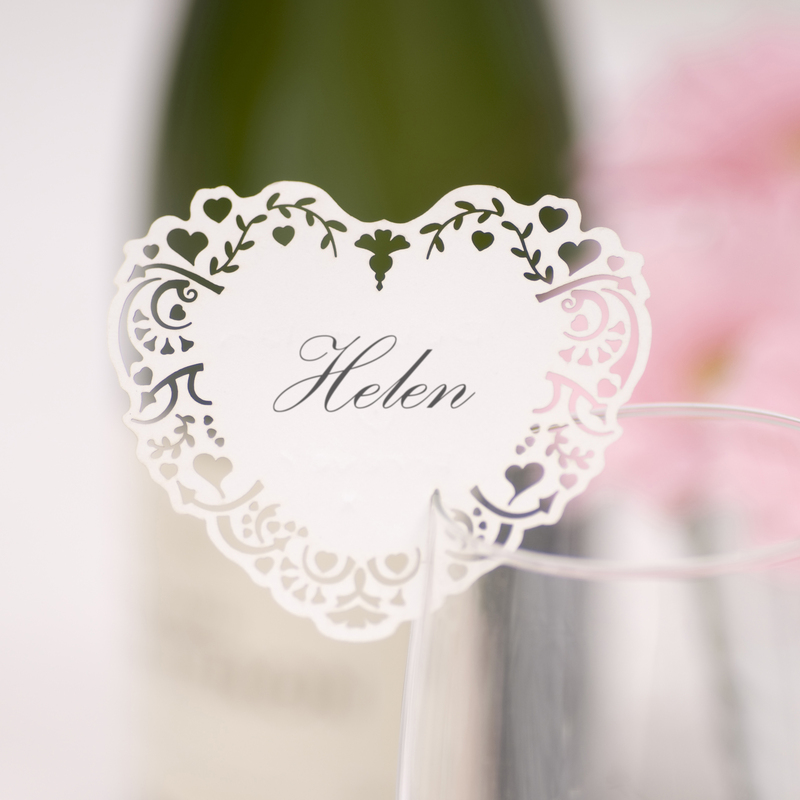 Pretty touches to add to your scheme include gorgeous laser-cut place cards, napkin rings and lottery ticket holders. 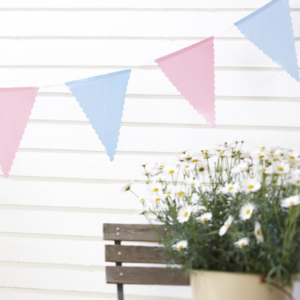 From the Vintage Rose range, choose from pretty polka-dot cotton bunting – use liberally around marquees, or pinned to your top table. The heart pegs and chalkboard signs and place holders also work well with a vintage theme. Staying in the past, the release of the eagerly anticipated remake of The Great Gatsby is expected to influence brides in their choice of dress and décor. Set in the glamorous 1920s, brides-to-be may take inspiration from the gorgeous fashions of the time – think delicate lace dresses, chandelier earrings and gorgeous 20s-style head-pieces. Translate the theme to your décor with lots of glass and crystals, echoing the fashion for Tiffany glass and ornate chandeliers which dominated the period. 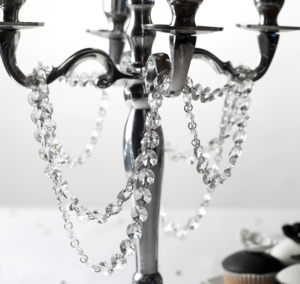 Our stunning table crystals add dazzle to a 20s-themed table, alongside crystal garlands which can be arranged around your centrepieces and flower arrangements. Finish your tables off with organza favour bags filled with silver foil hearts or dragees . For more wedding inspiration take a look at our wedding ranges here. Happy planning! This entry was posted in Elegant Entertaining and tagged 2013, Blog, celebration, Inspiration, love, Trends, Vintage Romance, Vintage Rose, Weddings by Neviti. Bookmark the permalink.